The itomaki are also known as nejime or neji (meaning ‘screw’), and they are usually hexagonal pegs getting thicker from the base towards the end you hold on to to turn. 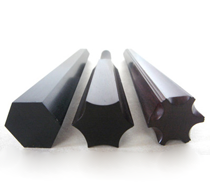 They can be ebony, ivory, redwood (Pterocarpus), or the like, but ebony is the most suitable for any shamisen because of its adhesive properties as the fukurin (washer). The three Itomaki are all put in at different angles. Following on from that, if you set up the Itomaki wrongly they will not stop the threads (that is, the threads will wind up badly and remain loose), and it will fail to secure the position of the holes for the threads to line up correctly. It is usual to put a nick in the base of the Itomaki to distinguish between those for the first, second and third threads. So in the first position there will be one groove, in the second position, two, and for the third thread there will be no notch. There is also the method of putting small red dots at the base of the head, with the number of dots representing the number of the thread. 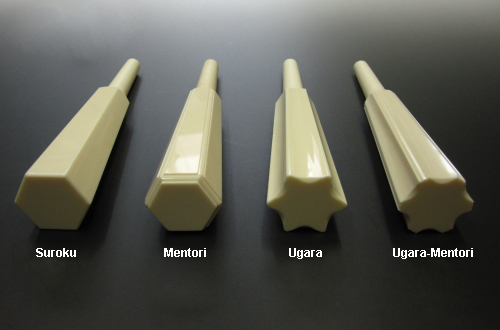 With regard to the shape of the Itomaki, for example, with ebony, there are ‘Suroku (plain hexagons)’ and ‘Mentori (chamfered ones)’. The hexagonal ones are easy to use as it difficult for your hand to slip. Chamfering, hollowing a little groove on the corners, is used on Itomaki that were a little smooth at the edges. Other shapes include petal types, the sharp-cornered ‘Ugara’ pattern (hemp stalk), smooth cornered chamfered ‘Ugara-Mentori’, and the spiral ‘Rasen’ design etc. Ivory pegs are said to be good for performance grade, but they take some training to use as they are not threaded, but straight pegs that push in without turning. The point about pushing them back in is that, while you are playing the strings can get loose, and you can sort them out at one stroke yourself. This is because ivory is hard and unlike redwood or ebony, doesn’t need a washer. Redwood is slippery, so the part that passes though the washer needs to be ebony. The other parts are left as they are: chamfered hexagonal redwood. Other materials may include crystal (acrylic), or imitation ivory (synthetic resin). Shamisen do not generally tend to have much decoration on them, so the subtle designs of the tuning pegs can be a simple enjoyment. * Tsugaru 25.5mm ~ 30mm, on average 27mm. There are only a few manufacturers that currently produce tuning pegs. The difference between each retailer is in preparation work, where the maker can try to line up the correct angle and spacing, and while doing that can trim the peg to the right size for each different shamisen. If that preparation does not go well, there is a high chance the peg will get no purchase and just keep turning. On the other hand, if you have just bought the shamisen through normal channels, you can often tighten the pegs up securely and set the strings yourself (although sometimes it is not possible). The peg size decreases with wear and tear, which makes it difficult to fit the original hole properly. This is one cause of looseness in the strings. If you look into the peg hole and the tip of the peg has deformed it has to be adjusted. If you want to correct it yourself take the peg out and while checking the point where you put it in the peg hole, evenly file it down from the centre. Furthermore, it may be necessary to adjust the peg hole itself. Since you need experience and tools, it may be better to have it done at a specialists’. One thing to watch out for in handling is that you cannot touch the tuning peg with your bare hands during removal or reinsertion. If you touch it, oils from your hand will cause slippage or sticking. Even those people who say, “I can’t stand this slippery feeling!” usually touch those parts and cause the problem!